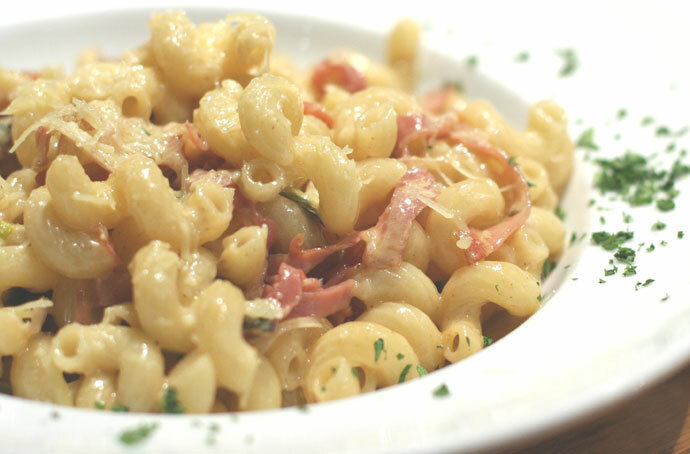 Another visit to the Hamilton Street Grill in Yaletown (1009 Hamilton Street, Vancouver, phone 604-331-1511) and I enjoyed their daily pasta special which was a macaroni with prosciutto, leeks, shallots, and lots of cheese (pictured below, $14). More photos: view Part 1, Part 2, and Part 3. 9,816 views. This entry was posted on Friday, October 5th, 2007 at 7:14 pm	and is filed under Burgers, Casual, Downtown, Grill, Hamburgers, Large Groups, Lunch, Lunch Specials, Pasta, Patio, Restaurant, Steakhouse, Steaks, Vancouver, Vancouver Restaurants, Yaletown. You can follow any responses to this entry through the RSS 2.0 feed. You can leave a response, or trackback from your own site.